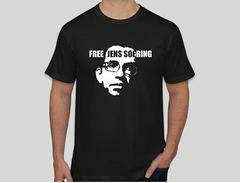 RICHMOND — Jens Soering, a German diplomat’s son convicted decades ago of a brutal double murder, has gained a notable ally in his long quest for freedom. Mary Kelly Tate, founding director of the University of Richmond’s Institute for Actual Innocence, announced Friday that she has written a letter to Gov. Terry McAuliffe (D) asking that he grant Soering a pardon. Her request is based, in part, on a DNA analysis that concludes Soering, who has type-O blood, was not the source of at least some of the type-O blood found at the scene. Tate, whose institute works to identify and exonerate people who have been wrongfully convicted in Virginia, has not taken over the case. It remains in the hands of a private Charlottesville lawyer, Steven Rosenfield, who has worked on it pro bono for years. But Tate hopes her letter, written after “a deep and close review of the documents and the factual and evidentiary underpinnings in this case,” will add credibility to Soering’s claims of innocence. Soering is serving two life sentences for the 1985 slayings of his girlfriend’s parents at their home in central Virginia. At the time of the murders, he and his girlfriend, Elizabeth Haysom, were honor students at the University of Virginia. Soering initially confessed to killing Derek and Nancy Haysom. But he eventually recanted, saying he was only trying to protect Elizabeth Haysom from the electric chair under the mistaken belief that he had diplomatic immunity because of his father’s position. He was convicted in a sensational 1990 trial that drew international media and gavel-to-gavel coverage on local cable television. Haysom pleaded guilty to being an accessory before the fact, contending that she helped plan the murders but did not physically take part. She is serving a 90-year sentence at the Fluvanna Correctional Center for Women near Charlottesville. She has maintained over the years that Soering alone did the killing. Soering’s supporters have raised questions about the case for decades, noting that he got some details of the crime scene wrong in his confession and dismissing as “junk science” a bloody sock print that prosecutors said tied him to the case. Over the years, as Soering gained attention for writing a string of books behind bars, German Chancellor Angela Merkel has pressed for his release. Now-Sen. Tim Kaine (D-Va.), at the urging of the German Embassy and Richmond’s Catholic bishop, agreed when he was governor in 2010 to transfer Soering to a German prison. But his Republican successor, Robert F. McDonnell, stopped the transfer because, once in Germany, Soering could have been released from prison after two years. 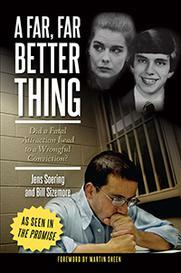 In March, the Virginia Parole Board rejected Soering’s request for parole. But he has a pending pardon request before McAuliffe. Brian Coy, a spokesman for the governor, declined to comment on Tate’s letter. The push to release Soering has picked up steam in the past year, with the release of a German documentary, “The Promise,” that suggested that Haysom committed the murders, perhaps with help from a drug dealer or two. A new blood analysis performed last year indicated that a man other than Soering was the source of the type-O blood found at the home of Derek and Nancy Haysom. The blood was the only physical evidence that purported to tie Soering to the scene aside from the disputed sock print. The DNA finding prompted Chuck Reid, a former Bedford County sheriff’s deputy who was originally assigned to the case, to begin speaking out about his belief that Virginia had locked up the wrong man. Earlier this year, Soering won another convert: Albemarle County Sheriff J.E. “Chip” Harding, who also wrote to McAuliffe after reviewing the case. But others remain convinced of Soering’s guilt. Among them is Maj. Ricky Gardner, who was on the case with Reid from the start. At the same time, Gardner pledged to “cooperate fully” with the state investigator looking into the case as part of the pardon request.